Why do I write? It’s not easy to answer such a basic question. Perhaps this is because I’m a compulsive wordsmith. I move restively between different genres – fiction, academic criticism, poetry, reference-work entries and journalism – seldom stopping to reflect on how these relate to one another. For me, writing somehow validates the day-to-day business of living. The only constant I’m aware of is that in virtually every case I enjoy the activity itself: the touch of pen on paper, of fingers on keyboard. I love to be published and to be read, but that comes second to the actual experience of putting words together. she chatters on to prove that she’s alive. in the static balance of a sun-blind world. losing itself in the ripples of the pool. and death is thwarted by the glaciers of the day. and the visions of Heaven and Hell in medieval mappae mundi. with Mecca at the centre and the south on top. but anywhere one cares to put them. Paco laughs himself to sleep. I remain best-known for my academic writing, which has been particularly concerned with revisionist geographies and ways in which the canonical dogmas into which I was initiated as a student crumble when literature crosses borders and seas. My book Postcolonial Con-Texts: Writing Back to the Canon (2001) dealt with this by considering the range of responses adopted by writers from the so-called “postcolonial” world who have engaged with the canon. Such responses can, of course, be oppositional, but keen to avoid locking such texts into the strait-jacket of a new canonical orthodoxy, I attempted to demonstrate that the most striking commonality in their politics and poetics is a dialogic provisionalism that often forces readers to reconsider the canonical originals that have provided their departure-points: it’s almost impossible to view Jane Eyre, wonderful novel though it is, in quite the same way, once one has read Jean Rhys’s Wide Sargasso Sea! My work in this area is reflected in the essay republished in this issue of Setu: “Wordy-Wallahs: Partnership Strategies in World Literatures in english”. Originally delivered as a conference plenary in Lecce, Italy, it was written as a contribution to the cross-cultural work of the Partnership Studies Group, founded at the University of Udine. After publishing Postcolonial Con-Texts, I unwittingly found myself writing numerous short essays on postcolonial geographies and some eight years ago I realized I had the germ of a book on this subject complete in my head, though several new chapters remained to be written. I was able to incorporate my lifelong love of animals, which I had never theorized or thought of in academic terms, into this book, along with work on environmental issues, which I continue to explore. There have been single-author books, too. The first was on V.S. Naipaul, a writer with whom I’ve become disenchanted over the years. Written as something of a diploma-piece, it’s a book I would gladly withdraw from circulation if that were possible! My books on Derek Walcott and R.K. Narayan had a different provenance and occupy a different place in my imagination. I can straightforwardly explain why I wrote them. The Walcott book, written for a series that requires comprehensive coverage of a writer’s work, grew out of an impulse to correct the view that sees him simply as a great poet. I’d been reading and writing about Walcott’s poems for many years, but I was also fascinated by his drama and I was eager to remedy the comparative neglect of his plays. 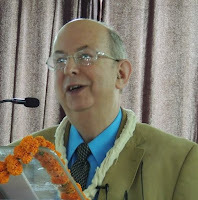 The Narayan book was prompted by a similar sense of mission. I felt that criticism of RKN’s work that represented him as a chronicler of a timeless India, seeing his imaginary town of Malgudi as a metonym for the nation itself, was misguided. Linking this to my interests in cultural geography, I set out to show how Malgudi was a shifting, unstable site. Lastly, my fiction. This is the work I value most, but where I have been least successful, though all the short stories I’ve ever written have been published. My fiction has usually been written slowly, painstakingly. I keep revisiting what I’ve written to check vocabulary, readability and continuity. My two best stories, “The Word”, which has been republished in Setu (http://www.setumag.com/2016/07/the-word-short-story.html), and “Himmelstein” (http://interlitq.org/issue6/john_thieme/job.php), a story about an English couple in the South of France, imagining an elusive stranger who appears to have stayed in their hotel, took a long time to write. I also spent ages writing Cabinets of Curiosities, a Condition of England novel that masquerades as a mystery. I think this is the best piece of writing I’ve ever completed. Working on it was pure pleasure, an end in itself, but after finishing it, the urge to share it through publication did emerge and at the time of writing, it has still to find an appropriate publisher. In addition to being asked “Why do I write?”, I’m sometimes asked if I write quickly. This varies, but, except when I’m writing fiction, I’m fortunate in usually being able to achieve a fair standard fairly swiftly. As a young lecturer in Guyana, South America, I used to write regular feature articles for one of the country’s national Sunday papers. Doing this as a “spare-time” pursuit meant I had to write quickly and succinctly, and I would regularly complete a 1,000-word piece in half a day. A boy with a bicycle would come to collect my copy and on a couple of occasions, when I hadn’t quite finished, he would wait for me to do so. This self-inflicted crash course in speed writing has stood me in good stead over the years, though, when I’m asked how long it takes me to complete a serious academic article, I have to answer it has varied: from three days to two years! And how long did it take me to write the present piece? I’ve been dreaming and misplaced my wristwatch.